I was brought up in York, called The Chocolate City, and can still remember the smell of the chocolate from Rowntree's factory. Delightful. If the wind blew in a different direction, the sickly-sweet but memorable smell from the sugar beet factory drifted our way. On the bus home we would sometimes pass Rowntree's when the hooter went and the workers poured out of the doors like a swarm of bees. 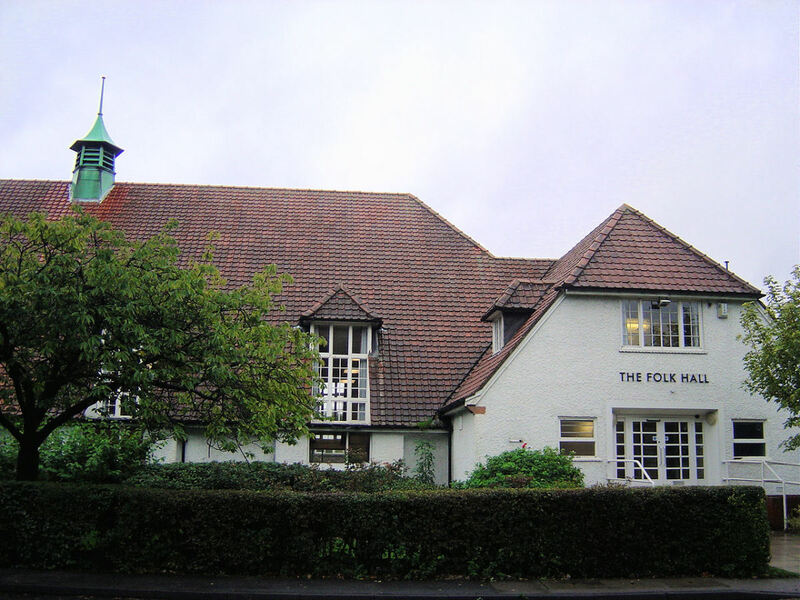 As if this wasn't enough, I went to Joseph Rowntree's Primary School in New Earswick, a model village created by the Quaker Rowntree family to house the workers; being Quakers there was no pub. As a teenager I was a Saturday girl in Terry's restaurant and my sister worked, albeit fleetingly, in Craven's sweet factory. Yes, the Chocolate and Sweet industry of York affected us all deeply. This is a personal as well as an historical venture into York, the City of Chocolate past and present. I hope you enjoy reading it as much as I have writing it. Every year the City of York's Libraries organise York's Big City Read , and in 2010 it was Joanne Harris' Chocolat . Not only did the libraries offer FREE copies of the book, but a fabulous programme of events was organised. The events included a "Meet the Author", Joanne Harris, Chocolate walks around York looking at the historical links between the city and chocolate, lectures by some of the cities historical experts, chocolate-making workshops, chocolate tasting for children and many other exciting things to do and see. 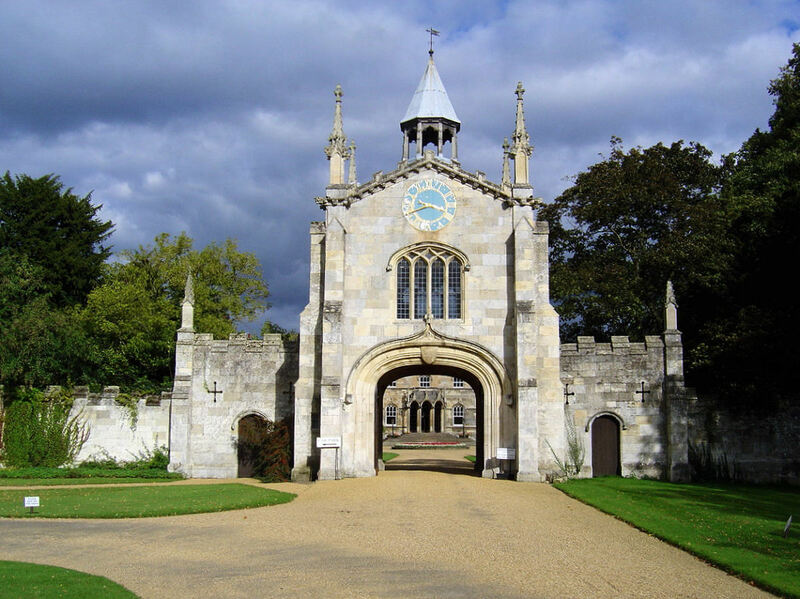 The event coincides with York's Food and Drinks Festival. It was this event that prompted me to think about York and its chocolate heritage. 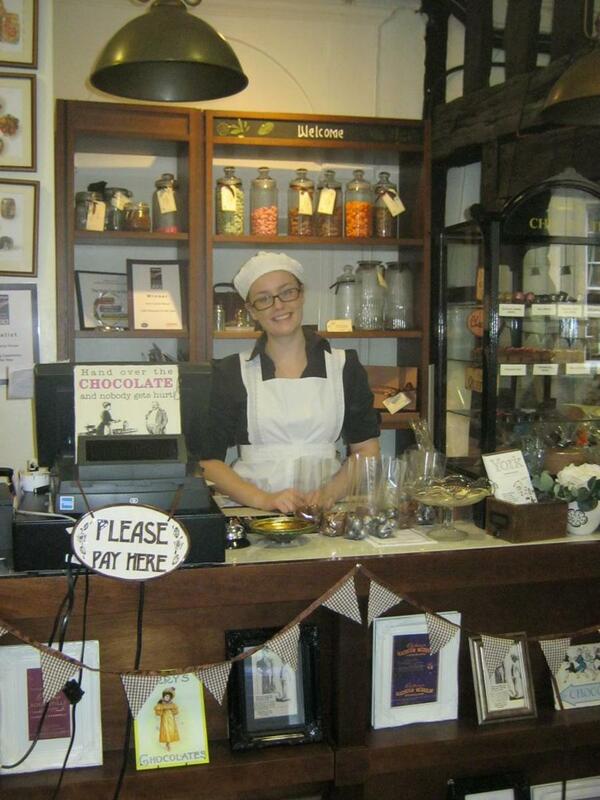 "York’s newest visitor attraction celebrating the story of chocolate and confectionery in the home of chocolate." So new that I haven't visited it yet! It's right in the centre of York, in King's Square. Visit the exhibition, taste chocolate at the chocolate bar. Why not indulge yourself and take a tour of York with an emphasis on chocolate and Sweets (they call it the Choccy & Sweetie Walk)? You'll follow a trail that will take you to existing chocolate shops and shops gone by. 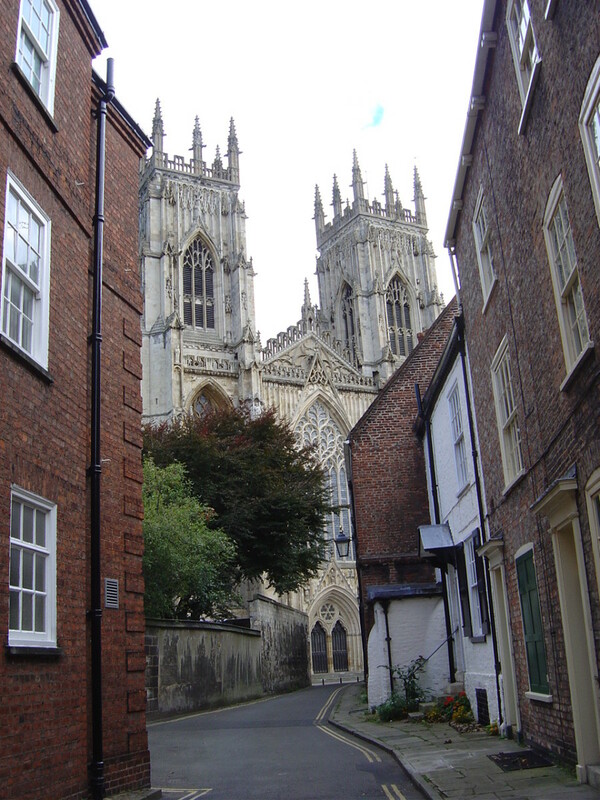 You'll compare present day sites with pictures of how York used to look, view commemorative plaques and church windows with a chocolate link and even visit Lush, the cosmetics and soaps shop. At each stop the staff of the various shops and establishments will give short talks about the business of chocolate. Finally you'll be taken to the most divine fudge kitchen and shop, watch the fudge being made and then be given a taste of the best fudge ever. Best of all, don't worry about the calories - you'll be walking them off! Prices: Adults £5.50, children under 5 free, 5 - 15 £3.50 plus various specials, see site below. You can also book through York Tourist Office however booking is not necessary. You can just about fit into this tiny, half timbered medieval shop, but if you can squeeze in you'll be well rewarded. 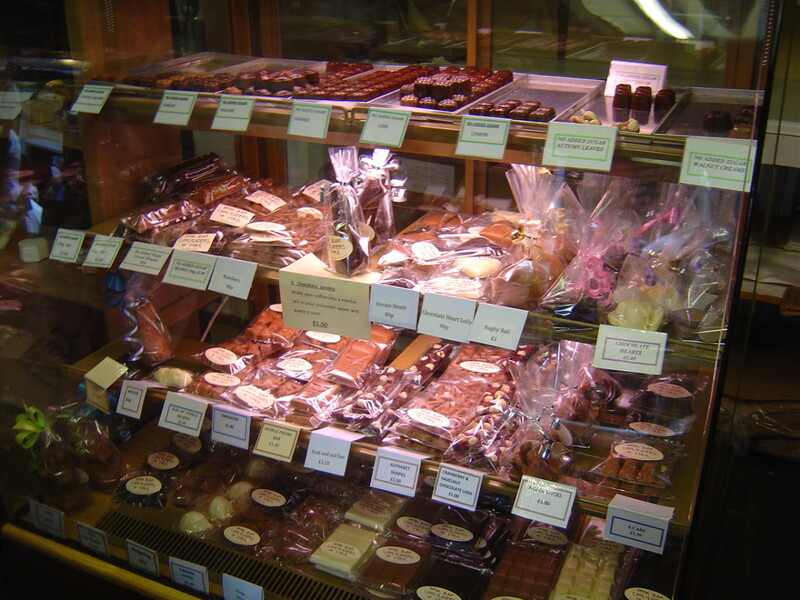 The only shop in York to make chocolates on the premises, (you can see the kitchens behind the shop through a small window), Monk Bar Chocolatiers are renowned for the superb quality and freshness of their products. Using the finest quality and fresh ingredients, Monk Bar Chocolatiers make small batches of over 60 varieties of luxury handmade chocolates. 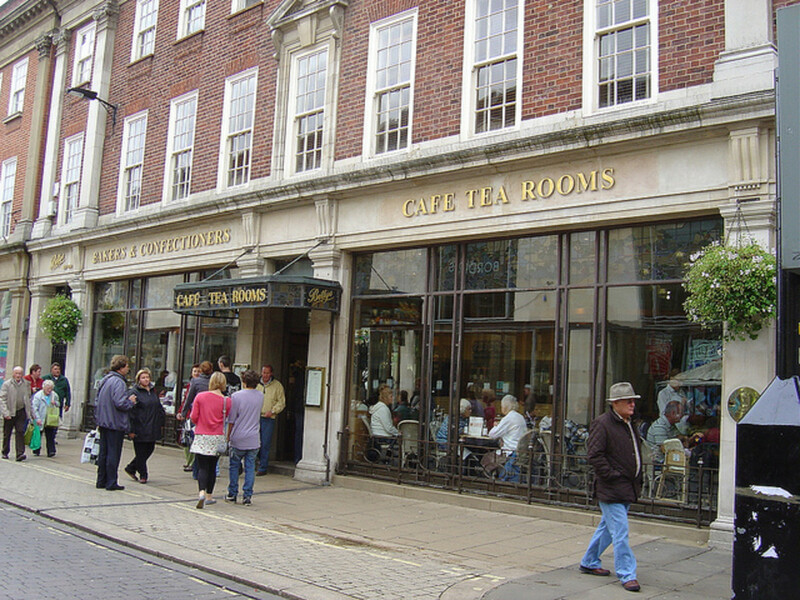 Ray Cardy first opened Monk Bar Chocolatiers in 1999 at 1 Goodramgate, right underneath Monk Bar, one of the historic gates into the beautiful city of York. His vision; to make high quality exclusive chocolates. In November 2002 a second shop was opened in York's most famous Street, ‘The Shambles’. The range is continually expanding and improving and I for one welcome the new ‘No Added Sugar’ chocolates. Unfortunately the Monk Bar shop was closed down c. 2015. Hotel Chocolat is a new shop in York for me but one which is a must on your shopping list as you can gauge from the photos; I tasted 100% chocolate here for the first time - 'interesting'. It all started over 15 years ago when the founders, Angus Thirlwell and Peter Harris, spotted a gap in the market - for really good quality chocolate. 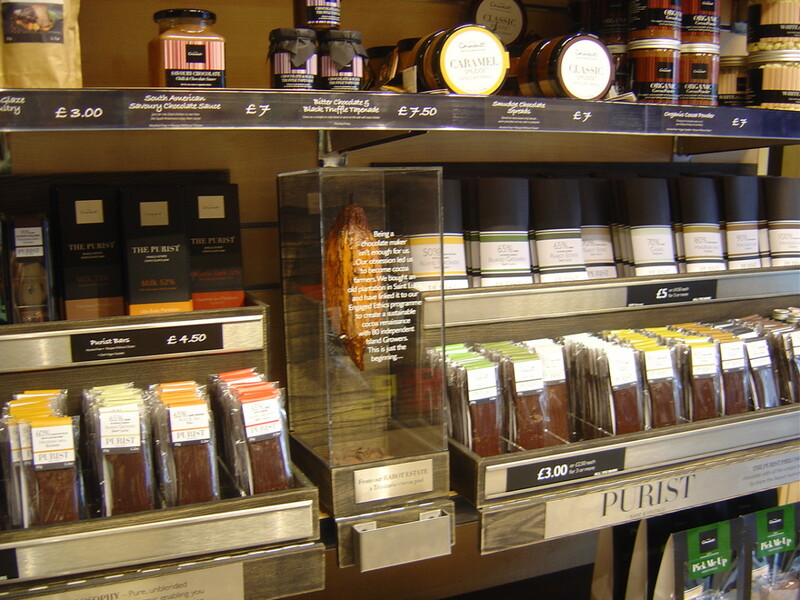 In 2004 the first of many Hotel Chocolat stores appeared on the high street. Authentic, wholesome ingredients are are used; they even bought their own plantation, West Indian cocoa plantation, Rabot Estate. To find out more about the Rabot Estate have a look at this video. Dating back to 1745, the cocoa estate is the oldest on the island and home to some very rare old trees which are of significant scientific and chocolate interest. Now a real hotel with luxury accommodation at the Rabot Estate Cocoa Plantation - just 14 Cocoa Pod Cottages and Villas make up the intimate and exclusive guest accommodation. Who can resist good food, exotic location and that total indulgence experience? Why not join their Tasting Club? Question: What is a shop that sells soaps and cosmetics doing on a chocolate walk? Answer: Lush uses a lot of cocoa butter in its products, and the products look good enough to eat. Not only do the cosmetics have names like Double Choc lip balm and Cup Cake face mask, but the face packs, bars of soap and bath balls are laid out and presented much as you would find in a scrumptious and exotic looking salad bar or old-fashioned sweet shop. On the other hand,, if you are a chocolate loving lover (rather than a lover of chocolate), you can buy a heart-shaped massage bar filled with real chocolate. Finger-licking good? The company began when Liz Weir and Mark Constantine met and started to make herbal hair and beauty products in 1977. They then set up Cosmetics to Go in 1987, a mail order business which was the predecessor to Lush as we know it today. 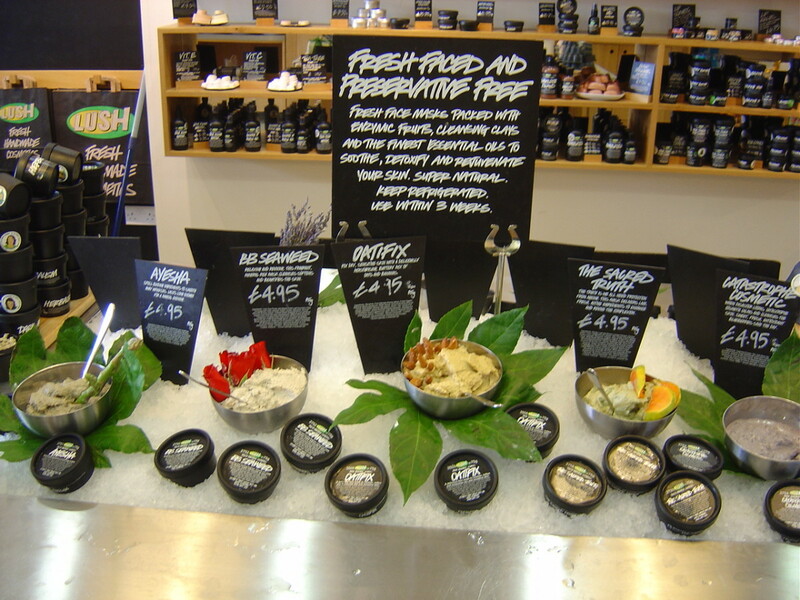 Lush specialises in fresh, hand made products using organic fruit and vegetables,the finest essential oils and safe synthetics and which have not been tested on animals. Little or no preservative is used, only vegetarian ingredients and minimal packaging. They believe in telling you when they were made. If you think that you've tasted fudge, think again. The fudge at Fudge Kitchen is in a league all on its own. 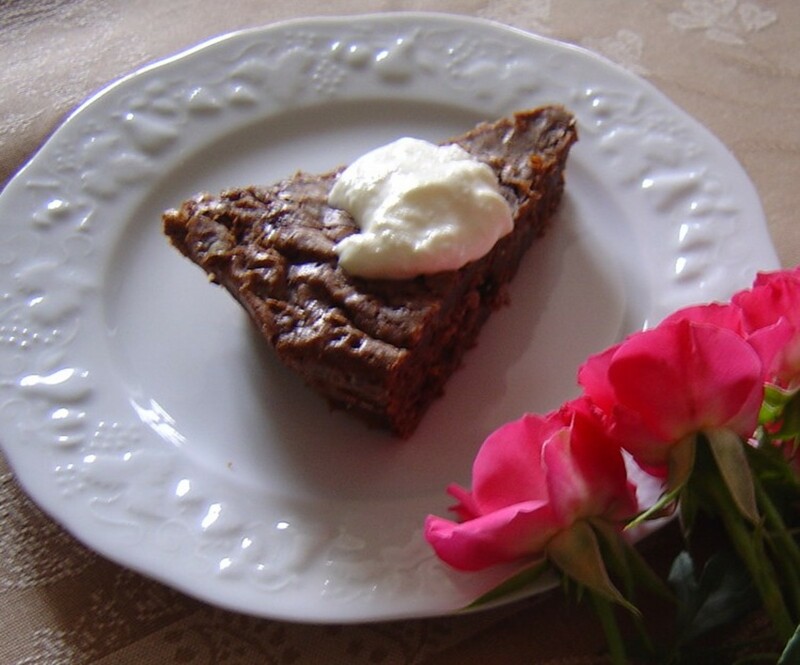 It’s made with fresh whipping cream instead of butter so it smooth, soft, rich, creamy. 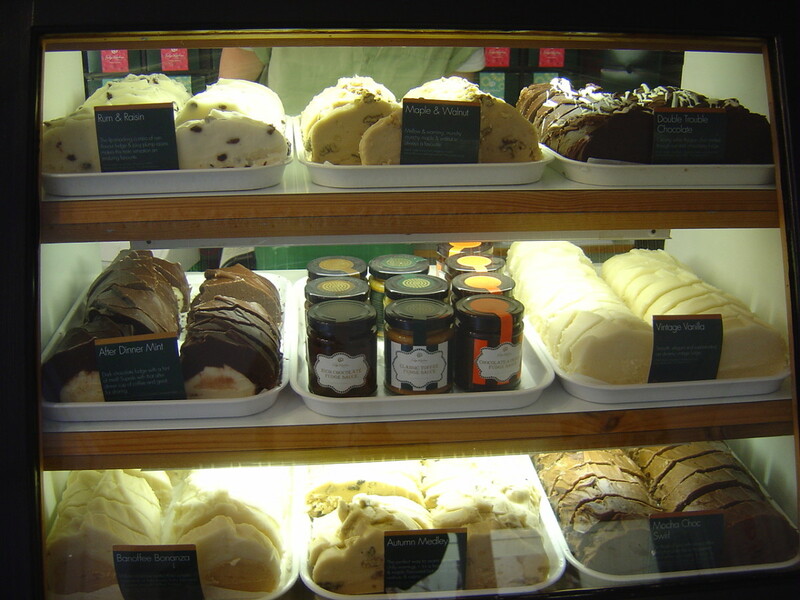 They produce an amazing variety of flavours - about 50 in all and have about 18 different flavours on the counter at any one time as well as additional seasonal flavours. Just take a look at the photo below and the unctuous pictures on their site. The other brilliant thing about Fudge Kitchen is that you can watch the fudge being made - just like in the video. You'll be delighted to see how sugar and cream are put into a giant copper pot and placed on a fire with an outsize thermometer and then stirred with what looks like a small rowing boat paddle. When the mixture is ready it is poured onto a marble top and worked until it turns into - well fudge. Brilliant. The whole process takes about 40 minutes from start to finish. There is a great story attached to to the foundation of Bettys Chocolate enterprise and it goes like this: "Great uncle Frederick, a Swiss chocolatier who died in 1952, came to England in 1907 and boarded the wrong train in London and so ended up in Yorkshire." Well truth is stranger than fiction and these things do happen. 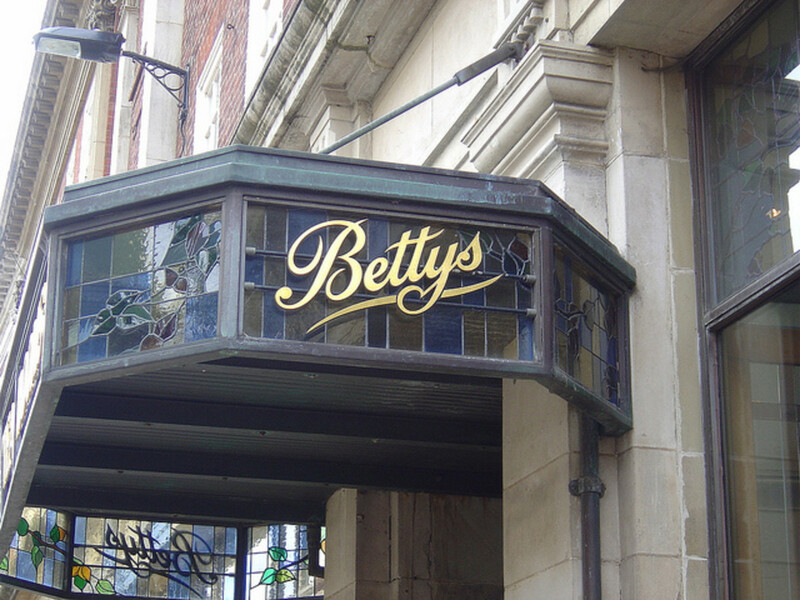 As long as I can remember there has been a Bettys in York on the corner of St Helen Square and as a teenager I would occasionally go for a coffee with friends, but only as a special treat. 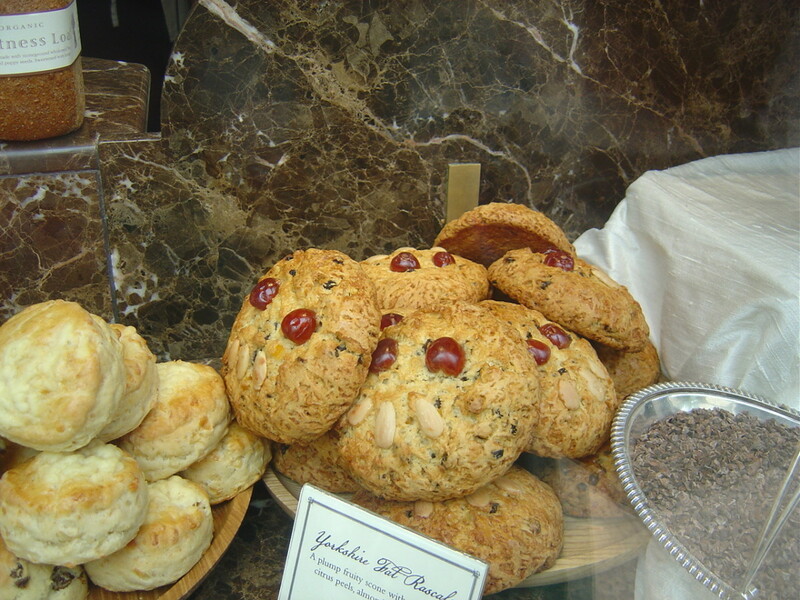 The problem with Bettys is its own popularity. You will usually have to queue and the prices are high, the portions small. I can't really say that the cafe represents great value unless you take into account the elegant art deco interior based on the splendid ship The Queen Mary, and all the history that goes with Bettys. The shop, on the other hand, has wonderful food and you pay a more sensible price. The one really good-value buy are their 'Fat Rascals', basically an enormous rock bun that will fill you up for several hours. A Little Bettys has opened in Stonegate in the shop I knew as Taylors, but you'll still have to queue I'm afraid. There are so many vintage ranges of chocolates that I had almost forgotten about until I revisited Thorntons. They remain an innovative company, always improving and building on their range. 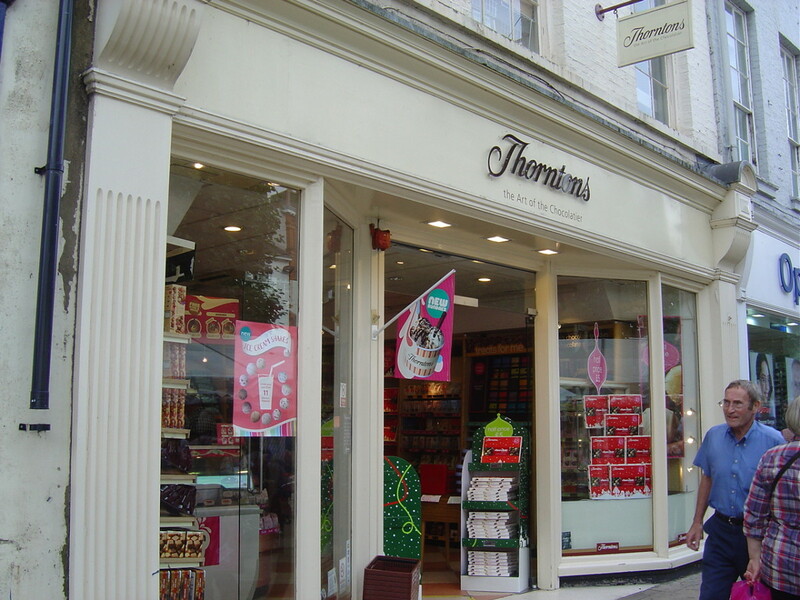 Thornton's have been making delicious chocolates for almost a hundred years. The first shop was opened in Sheffield by Joseph William Thornton, who then handed over responsibility to his sons. Thornton made its name by creating a uniquely rich and chewy ‘special’ toffee, that became so popular it became the fuel of the city’s steelworkers. Later, just after the Second World War, they hired one of Europe’s finest chocolatiers, Walter Willem, to bring Europe’s finest soft-centred chocolates to the UK and created well known Continental range. The other major innovation that Thornton's made was writing special messages, the 'Happy Easter' on your Easter egg came from them. York Cocoa House was a dream come true for self-taught chocolatier Sophie when it opened in November 2011, but you wouldn't think it was a new business to look at it. Smiley waitresses dressed in period clothes serve the most temptingly presented confectionery in a light, bright and airy shop and tea room. Some of the goodies are home made while others are made by other chocolatiers. If you haven't been to York Cocoa House yet then you're in for a real treat. 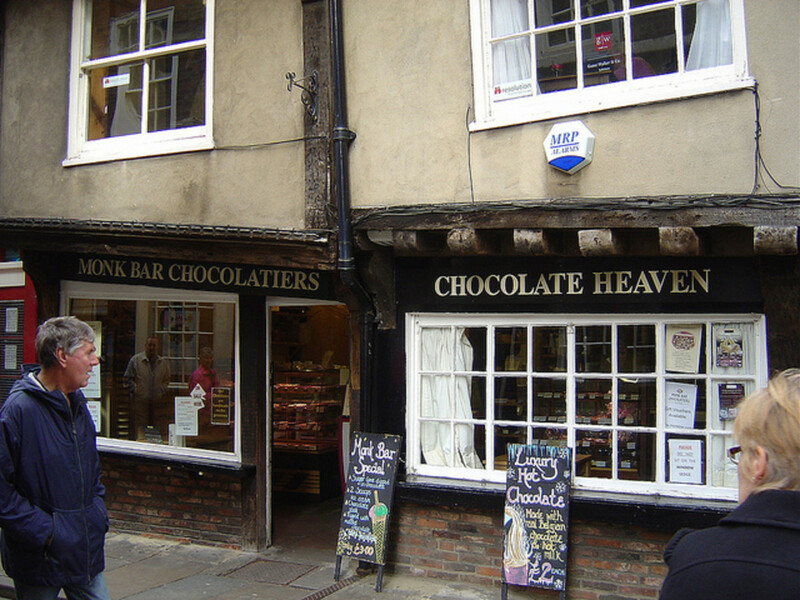 The shops described above give the impression of a flourishing chocolate trade in York today, but while retail is strong, the manufacturing base has all but disappeared from York. The Cacao bean became know to the west in the 16th century, but it wasn’t turned into chocolate until the industrial revolution and York became a centre for this production in the 19th century. Joseph Terry, Joseph Rowntree, and Mary Craven were three entrepreneurs who independently moved into production of chocolate and sweets. First the rivers then the railway brought raw ingredients like cocoa, sugar and fruit rinds, into the city, and allowed the finished product to be sold far beyond York. The railway took the finished goods out. By the end of the 19th century, the confectionery industry was second only to the railways as an employer in York, and it was a major source of employment for young women. 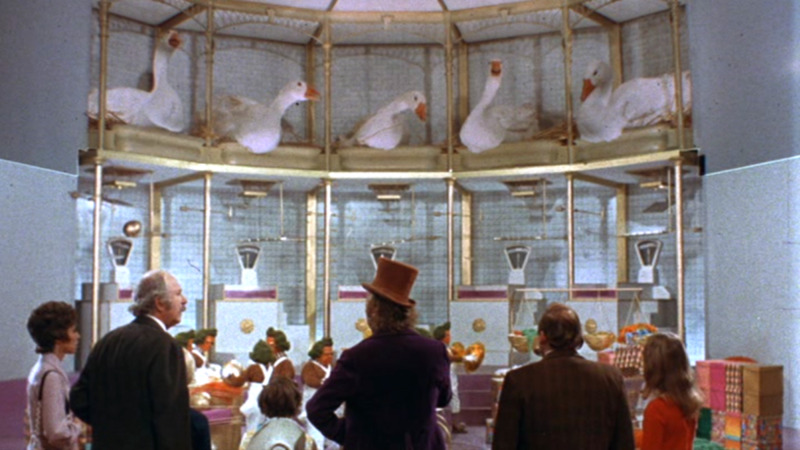 Today the future of chocolate and confectionery manufacture in York is uncertain. Rowntrees is now owned by Nestlé, Terry's was bought by Suchard and has ceased production and Craven's disappeared in the 1970s. You can't see from the photo, but the hands on the Terry's factory clock point to letters and not numbers. These letters spell out 'Terrys York'. However today the factory lies empty and waiting conversion into residential accommodation, it marks the End of an Era as on Friday 30 September 2005 the iconic York factory closed down. How many of us remember the famous Terry's Chocolate Orange? (Did you know that they started as chocolate apples? Hmm... no wonder they changed it. You can see a Chocolate apple in the Castle Museum in York. Chocolate Lemons also existed.) Terry's All Gold is another memorable product. Joseph Terry became a partner in the confectionery business of Robert Berry in 1823. He died in 1850 and left the business to his son, Joseph Terry junior. Joseph Terry and Sons moved to the current site, next to York Racecourse, at Bishopthorpe Road in 1926. Terry’s was taken over by Kraft in 1993 and the York factory was closed on 30 September 2005 when production moved to various plants across Europe. Terry's factory site is now called The Chocolate Works, development company Grantside Ltd has consulted local people on how to develop the site. A previous bid by the company to develop the site was rejected by the City of York Council. 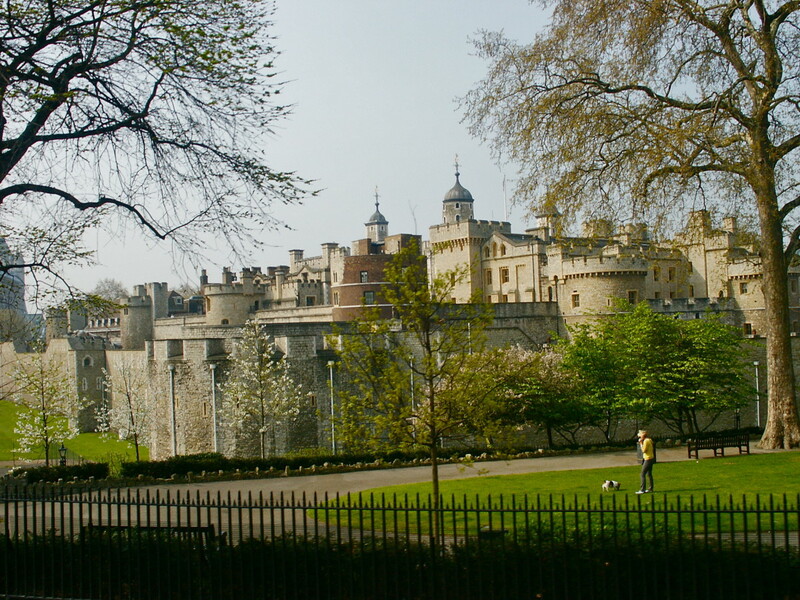 However, on 3 February 2010 the current planning application was accepted and the site will be developed with a mix of residential, commercial and leisure. As school children in the model village of New Earswick built by the Rowntree family, we were taught the mnemonic "Rowntrees of York Gives Better Value" in order to remember the colours of the rainbow. I thought nothing of it at the time and am really only making the connection now as I write this article. That is how thoroughly the Rowntree chocolate business permeated the very souls of the inhabitants of York. Rowntree's was founded in York in 1862 by Henry Isaac Rowntree, who bought the chocolate company from the Tuke family. In 1869 he was joined by his brother the philanthropist Joseph Rowntree. The original factory was in the centre of the City of York, next to the River Ouse at Tanners Moat, but relocated in 1906 to Haxby Road in the north of the City. In 1969 it merged with the company Mackintosh to become Rowntree Mackintosh, in 1988 it was taken over by Nestlé. In 1994 Rolo, Yorkie and Easter egg production was moved to York when the Nestle-Rowntree factory in Norwich was closed. In September 2006, it was announced that the manufacture of Smarties was to be moved abroad causing 646 job losses at the York factory. Rowntree was responsible for such British Empire chocolate favourites as Kit Kat, Smarties, Aero, Fruit Pastilles, fruit gums and Black Magic, whilst John Mackintosh and Co. were behind Rolo, Munchies, Caramac and Quality Street and in May 2009, Nestle launched Randoms, a new jelly sweet, under the Rowntree brand. See videos of the 2007 Factory Tours here. It remains to be seen how Kraft's recent take over of Cadbury will affect Rowntrees but let's hope that chocolate production survives on this historic site. Cravens, a firm of confectioners founded in 1803 was taken over by Mary Craven who initiated the production of sugared almonds in the French Almond Works, York. 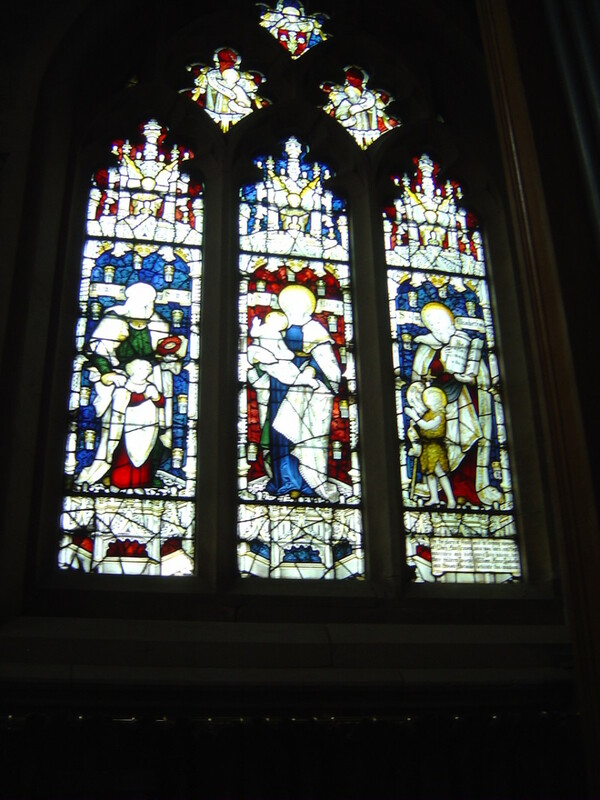 She is commemorated in a window in the east end of the All Saints Church, the Pavement, which is near the site of the original factory in Coppergate. 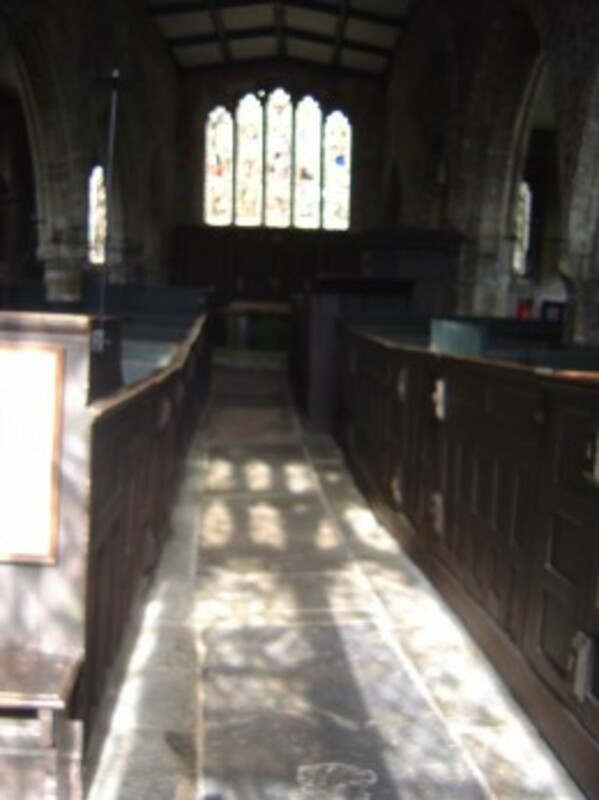 In 1966 and between 1976 and 1981, the York Archaeological Trust conducted extensive excavations in the area. An open-air pedestrian shopping centre, Coppergate Shopping Centre, now occupies the site. After a series of take overs involving the big names in confectionery, Tangerine became the new owners of Monkhill Confectionery in February 2008. Monkhill Confectionery was acquired from Cadbury Schweppes and this instantly made Tangerine one of Europe's largest sugar confectionery businesses. At that time the factory had a £80 million turnover and manufacture two million sweets a year, including household names like Sharps of York, Barratt Sherbet Fountains, Jameson's chocolates, Trebor Basset mints and, at its Pontefract factory, Butterkist popcorn. . There is a mysterious absence of information about Craven's fctory on the internet. Please leave a message below if you can contribute to a brief history of the Company. As a teenager I used to 'hang out' in York Theatre Royal so I have a big soft spot for the place. Imagine how cross I am to miss this production of Blood and Chocolate! The story is inspired by the people who worked in the chocolate factories of York during the First World War, and by their employees. It is a great opportunity for the local people as the cast will include hundreds of extras from the community. The production will also use the city and its locations. York was at the forefront of Chocolate industry as chocolate spread into Europe. Those well-known leaders, Fry and Cadbury, both served apprenticeships in the City of York before spreading their wings and this close bond between York and chocolate became even more important during the first world war. In 1914 at Christmas a chocolate tin, designed and made at the Rowntree's factory was sent to every soldier from York who fought at the front by the Lord Mayor of York. The war brought great social change to York as the women of the city moved into the factories to replace the men who had gone to war. Blood and Chocolate looks at the changes that took place as the people struggled with the conscientious objection and family loyalties. Blood and Chocolate was written by Mike Kenny, directed by Alan Lane and designed by Anna Gooch (not be confused with the 2007 film directed by Katja von Garnier about a nineteen year old werewolf). Join us in the original Chocolate City to learn, indulge and discover the history of chocolate. So why not take the time to discover more? There is so much to see and do in York that you could spend a lifetime here and still discover something new. The shops and factories I've touched on here are just the tip of the iceberg; Yorks chocolate history is extensive and fascinating. If you do come to York and find out more, remember to leave a comment below so this site can grow. Think you could write for HubPages? Join us by clicking here. Give yourself a touch of luxury of times gone by. 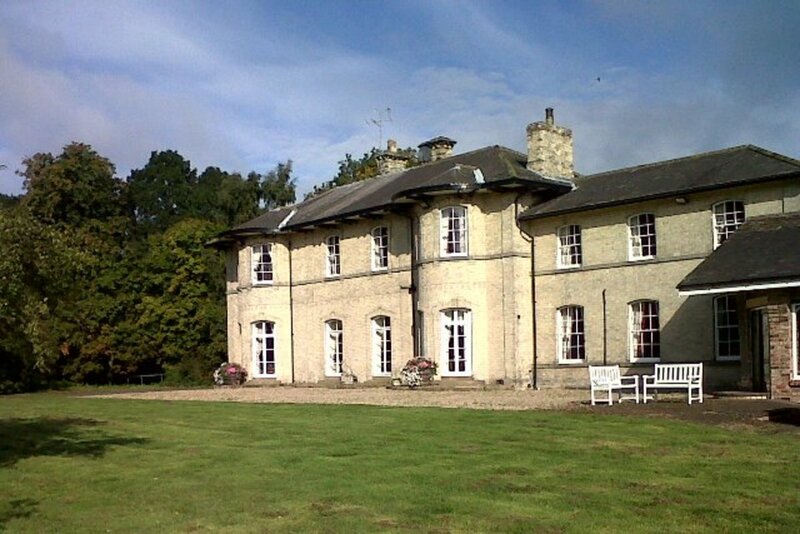 Blackwood Hall is a beautiful Georgian country home situated between Selby and York and owned by my sister (really!). There's plenty of secure parking in the fourteen acre grounds, complete with small lake, and the house is opposite Skipwith Common where you can see wild ponies. A family run guest house offering modern facilities and great breakfasts within easy walking distance of York Racecourse and York College. 30 min walk into the City or 10 mins by bus. Free on site parking & WiFi. Time to ditch the diet because the real secret of good health is that a little of what you fancy does you good, and are you going to fancy this gorgeous, gooey chocolate cake made with a recipe given to me in France! Although it is ridiculously easy and totally reliable, it is a treat cake and ideal for special occasions or surprise guests. If you don't like chocolate, (yes, such people do exist, believe it or not), then why not try one of my other favourites, Almond and Orange Cake. This cake is tangy, moist, gluten free and fat free. Chocolate too fattening? Have a look at the edible garden project that is dedicated to turn York into an edible city. Chocolate that doesn't make you fat! Eggs have long been a part of the celebration of Easter. However, chocolate Easter eggs have only been around for about 200 years. Learn how chocolate eggs came into being and how they made their way into Easter Baskets and Easter Egg Hunts. Learn more about the history of the famous Terry's chocolate factory - which was a York icon for two centuries. Do you have any York sweet or chocolate comments? Thanks for the information. My pub days are over but this is great for anyone reading this Hub. I'll have to look in at the Shambles. 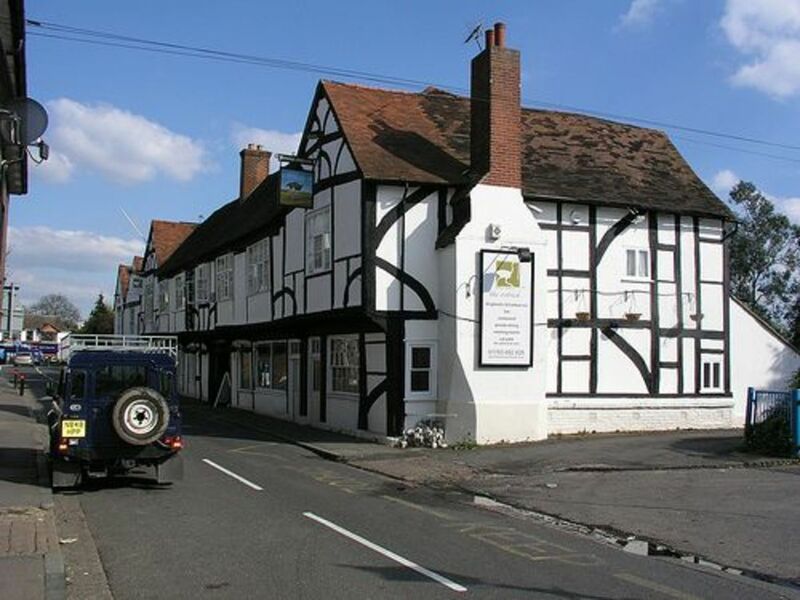 When I first went to the Old Starre Inn, and for a while afterwards it was a Cameron's pub and always busy. I went back a couple of years ago and found it had changed hands, now a Webster's pub, and the quality of its cellar had sunk a bit. I also used to go to The Bridge at the south end of Lendal Bridge and that's gone upmarket. Pricey! Nowadays I go to the Sam Smith's pub on King's Staith or Lendal Cellar. Alan, I phoned the Monk Bar Chocolatiers and although they've closed the Monk Bar shop, their other shop in the Shambles is still open. Thanks for the note about the Choc shop. What a shame! I'm going back in the Autumn so I'll have to do another chocolate tour and check out what's happening. Note the words HAVE TO. Betty's is very crowded /Popular and not great value but it's nice to do as a 'tourist' kind of thing. Once thing for sure is you're spoilt for choice with pubs. In my youth we haunted The Punch Bowl and The Olde Starre Inn in Stonegate (which I note Tripadvisor has voted the worst pub in York! ), but now if I need a cup of tea I try to go to the college in Exhibition Square or a 'greasy spoon' run by lovely Turkish people near the old Rowntrees factory. I'll have to keep my eyes open for your pubs and Russian chip shop. 'Ey up, ye're a Yorksher lass fra Yoork then, like? Nice trip back through this here page. It's second home to me, I stop off here on my way back from further north and sometimes make a point of taking a few days off here. The Monkbar Chocolate shop upped sticks last year or thereabouts. I noticed a couple of trips ago (when I stayed on the Huntington road) after visiting Monkbar Models across the road. I was going to buy some proper choccy for the little woman (she's a Cockney but for all that she still deserves a proper treat). Shame about Terry's. I believe they've moved to Bristol or somewhere down that way. As for Cravens, they just bit the bullet. Whenever I pass Betty's it's always full, so I tend to go to the Lendal Cellars or the King's Staith (I like a good pint, and there's a Russian-owned chip shop up on Micklegate past the church). I'm so pleased that you enjoyed it, prasetio30. Many thanks for leaving this message. I love chocolate and I love this hub as well. Thanks to introduce to us about chocolate industry. I also enjoy all the pictures and the video. Voted up! I've looked at your great fudge articles! Love fudge and chocolate, but not much else in the way of confection. Many thanks for dropping by Peggy. It was interesting visiting Lush with the chocolate and sweetie tour. They had lots of tempting chocolate products. I agree, a lovely shop. The cosmetics looked good enough to eat. Many thanks for this contribution, tobusiness. Do you have any pictures that I could add to the hub? Or accounts? I went on a school visit to Rowntrees and can still rember some of it. Fascinating. It is divine! You really must discover chocolate York! Thank you so much for these kind words, randomcreative, and for your congratulations. I was thrilled! Never thought of it like that. Thanks theraggededge. Definitely! York has changed so much since I was a child, and largely for the better. Well worth a return visit christin53! Thank you so much Eiddwen. York is well worth a return visit, isn't it. I have been to York many a time so this hub was a treat; thanks for sharing and enjoy your weeekend. Excellent hub! I would love to visit and take this tour and you have given me all the information I could ever need. I think I would be the most anxious to try the fudge made with real whipping cream. Sounds divine! Interesting hub I am from York,PA which also has a history of chocolate the York peppermint patty and Wolfgang's candy and the Hersey chocolate factory across the river in Hersey. A wonderful article, I loved seeing all those familiar places. My husband is originally from York, he actually worked for Rowntrees as a lad, he also designed a chocolate box for them many moons ago. Voting up all the way. Congratulations on your Hub of the Day award. Well deserved! I can almost smell the chocolate from here as you described each place on that chocolate tour so well. We have friends that went to Mackinac Island in Michigan and one reason Lisa was so excited was because of their homemade fudge shops. She let me use her photos in several hubs I wrote about that unique place. If they ever plan a trip to York...I'll be sure and tell them about this chocolate tour. Up votes and sharing! Lovely, lovely hub! I must re-read it a bit later again with a cup of tea and a bit of chocolate! Mmmm, I could just eat some of that fudge or chocolate. 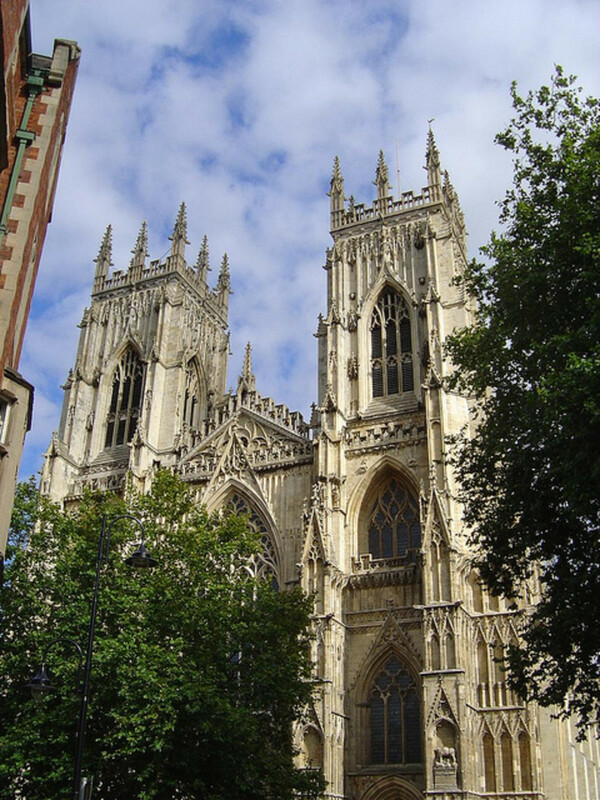 I am from Yorkshire and my sister lives in York . I knew about Terry´s and Rowntrees of course, and we also had a Terry´s factory very near where I was born and brought up ( The factory was in Hemsworth) But I didn´t know about all the other chocolate makers. I am going to link this hub with one of mine on York. Hope that´s OK. But it will add another attraction to the list I did for visitors to Yorkshire. My aim is to get more foreign visitors to give Yorkshire a go instead of London, Edinburgh and Dublin. I live in Valencia now and every single Spaniard I know who goes to the UK visits these places and no other. Great hub, well done on winning HOTD. I can see a lot of work went into it. I love this hub! I'm ready to hop on a plane bound for York right now! I will definitely visit some of these fabulous places you've mentioned if we ever make the trip. Congrats on a well-deserved HOTD! 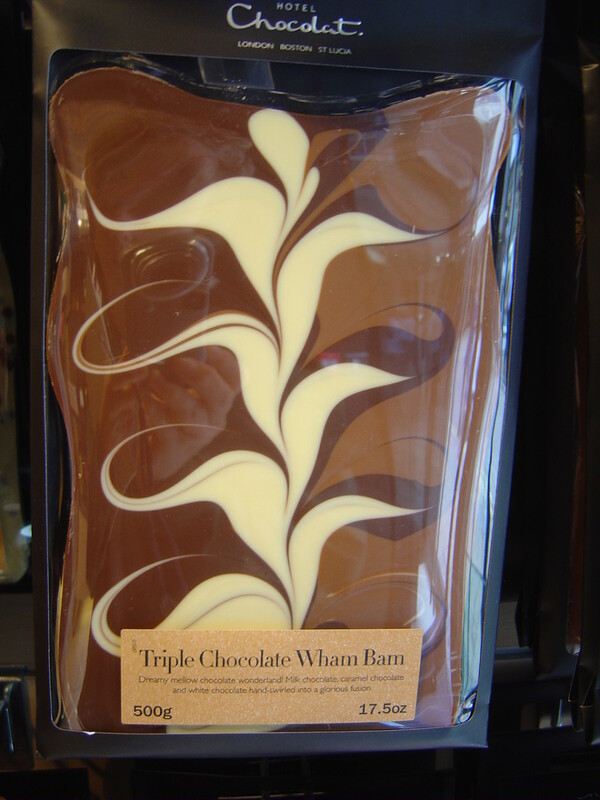 Well deserved HOTD, I can attest to the deliciousness of Hotel Chocolat's chocolate - I get a big smile on my face if I get one of their giant chocolate slabs for my birthday! York seems to be a place of memorable smells - I remember it for the 'authentic' smells of the Jorvik Centre. I think I need to go back and smell the chocolate instead. Congratulations on the hub of the day! This is a wonderful tour to the city of chocolate in York. This is a well written hub. Voted up and more. Thanks for sharing this with us. Have a lovely weekend! Ditto the first comment on this York, City of Chocolate hub and congrats on your Hub of the Day award! Wow! Now THIS is a Hub of the Day!!! Great subject, beautifully presented, intriging from start to finish. Well done and would love to visit. I can smell the chocolate from my own kitchen! Great info combined with yumminess - can't beat it! Thank you so much for dropping by, HouseBuyerUS. Pleased you enjoyed it. Hi! This is an absolutely excellent Hub!! I was also raised in York after my family moved from Glasgow in 1969. 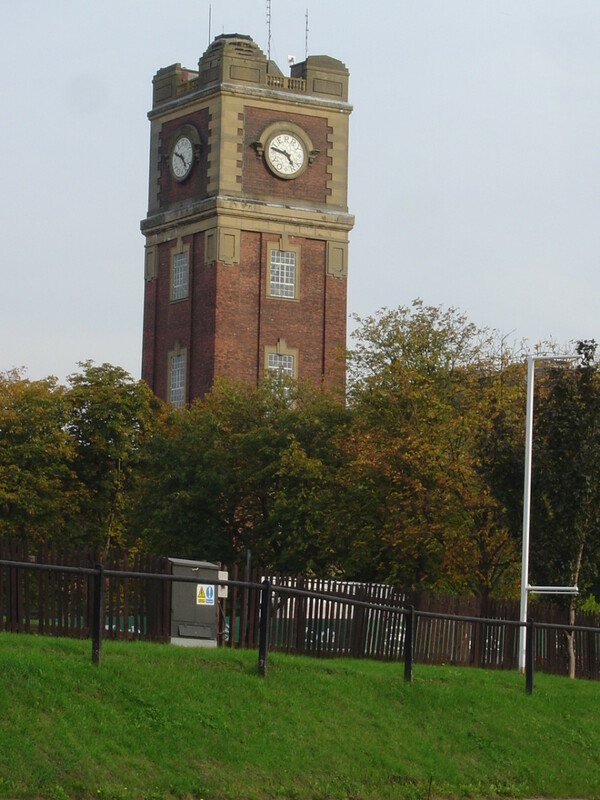 I worked at Rowntrees for 6 months in between leaving Archbishop Holgate´s Grammar School and going to Leeds Uni. 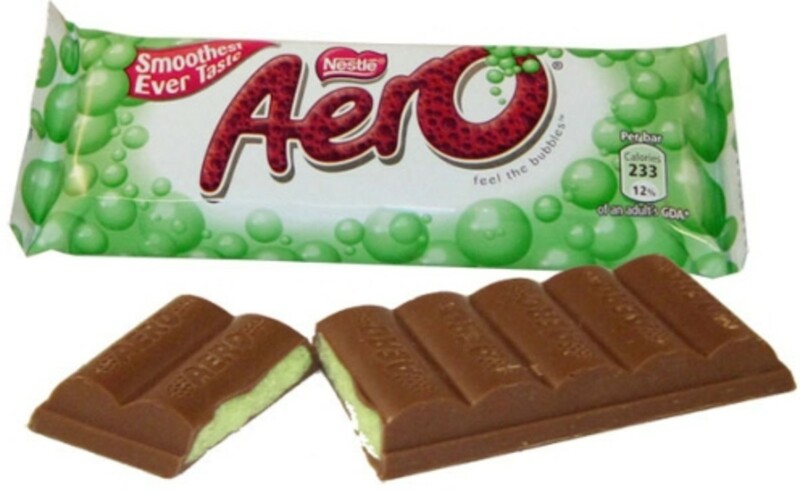 But my "claim to fame" regarding KitKat - apart from dipping the actual biscuits into the chocolate in the factory (very hungover during Xmas)- must be https://hubpages.com/business/Kit-Kat-TV-Commercia... Enjoy!!!! Thanks for your comment, Paul. You didn't leave a link so I can't contact you directly. Haven't come across Jamesons, I'll have to look into that. Not much on Cravens, except that my sister worked there fleetingly and might have a few anecdotes. Do send me a link to your article when finished. WHAT A GREAT SITE. IF YOU HAVE ANY MORE INFO ON JAMESONS AND THE CRAVEN CONNECTION THEN PLEASE DO LET ME KNOW. I AM THE AUTHOR OF SHIRE PRESS' CHOCOLATE AND ALSO OF YORK AND ITS CHOCOLATE INDUSTRY COMING OUT IN FEBRUARY. I AM CURRENTLY RESEARCHING ANOTHER BOOK ON YORKSHIRE CONFECTIONERY, HENCE THE INTEREST IN JAMESONS. Many thanks for leaving this message, Bill. York is a great place, and I must admit I'm grateful to have had such a stimulating environment throughout my childhood. Of course we took it all for granted, including the chocolate links. Tinsky, pleased to meet another York fan and one-time resident. There are quite a few of us on HubPages. We should start a fan club. I agree with you that the chocolate here is gorgeous - and you must try that fudge as well. Oh yum! This article has taken me back in time! I was a student living in Bubwith Yorkshire from March '92 to March '93 and every Saturday we would go into York to get groceries. Can I say that the chocolates form York are divine? I miss York and one day I am looking forward to going back for a treat. Cath@VWXYNot? It is so nice to have these shared memories. Scents of childhood! Are you still in York? We should form a Hubbers from York community, there are a few of here. Great article - I went to Jo Ro too, and remember the smell of chocolate and sugar beet! Thanks for the fan mail. Fudge is part of the hubmob contest hub I wrote this week. It is a main tourist attraction on the little resort island I used to work at as a teen. Many thnks, Denise, for your comment. Must say it was a good combination of fact, history fudge and chocolate. Yum! Your title caught my eye and the rest was sweet indulgence. Wish I could take that chocolate tour. Cool hub.